Kegels are performed by contracting the pelvic floor muscles similar to when you are holding in urine. By holding these muscles momentarily and releasing, you can work on strengthening your pelvic floor muscles, which is great to prevent leaks. Although Kegel exercises are a great way to strengthen pelvic floor muscles, you can prevent leaks further by complimenting your Kegels with other exercises targeted at your pelvic floor. Those exercises are yoga poses and are easy to do in the comfort of your own home. 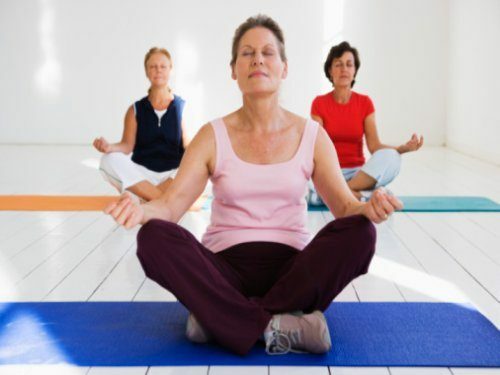 Yoga has grown in popularity for its overall health benefits, so it’s no surprise that it can go a long way in supporting bladder health too. Below are nine yoga poses that can help strengthen your pelvic floor muscles and prevent bladder leaks. To complete the warrior 2 stance, begin in a lunge position with your right foot in front of your left foot. Your right knee should be bent at 90 degrees and toes should be pointed toward the front of the room (or straight ahead). Rotate your torso so that it is facing forward along with your left foot. Your back leg should be straight and your right foot should be aligned with your second and third toe. Now inhale and raise your arms and hands so they are at the height of your shoulders straight out. Keep your core engaged and stay in this position for 12 to 15 breaths. While still in your warrior 2 stance, bring your right hand either to the floor on a yoga block, or have your elbow resting on your forward knee. Extend your left arm upwards toward the sky (or ceiling) and press your back left foot to the ground. On your inhales, try to create as much space as possible between your arm and back leg. On your exhales, roll your chest upward toward the sky. Hold this position for 15 breaths. For this position envision yourself becoming a triangle. To achieve the triangle shape extend your front leg from your extended side angle pose so now both legs are straight but still apart. Your right hand will now be to the floor – or yoga block, if needed – but no longer resting on your knee. Your Left arm is now straight up to the sky. Hold this position for 12 breaths. If you can’t reach your hand to the floor it can be rested on your shin. Once you complete all three poses on your right side you can repeat them on your left side. Once you completed the three yoga poses in sequence on either side it’s time to come down to your mat onto your back. Lay on your back with knees bent and feet flat on the floor. Your feet should be parallel to one another and hip length apart. Arms are flat by your side. Now, lift your buttocks off the floor and upwards. Push your knees forward to lengthen your tailbone and the back of your knees. Stay in this position for 12 breaths. This is the same position as the bridge pose, with the addition of raising to the air one leg. Start in a squatting position with your feet as close together as possible and slightly pointing outward. With your heels on the floor, a folded towel can be placed underneath them if this isn’t possible at first. Now separate your thighs slightly wider than your body, and then lean forward between your thighs. While doing this, place your elbows on the inside of your knees with your palms together in a prayer position and gently push against your knees. Hold for 30 seconds while breathing gently through the nose. Lay on your back and bring the soles of your feet together so your knees are bent outwards. Hands are flat by your side. You can put pillows or wrapped up towels beneath your lower back and neck for added support. Lay facing upwards and put your legs on a wall for support. If done for around 10 minutes, the pose can improve circulation and rejuvenate you. Resting pose, in which the person sits with the body curled up and faces the floor. It helps improve calmness while giving the back and legs a mild stretch. By completing these yoga poses daily, you can have greater success in strengthening your pelvic floor muscles and preventing embarrassing bladder leaks.